Describing the decision of two Gano Forum MPs-elect to take oath as personal one, BNP senior leader Khandaker Mosharraf Hossain on Sunday said their party is determined not to join parliament. “It’s not an election at all on December 30, and we turned down the so-called election of vote robbery. It was the decision of BNP and the Jatiya Oikya Front that no one of our MPs-elect would go to parliament,” he said. Mosharraf, a BNP standing committee members, came up with the remarks while talking to reporters after placing wreaths at their party founder Ziaur Rahman’s grave together with members of newly formed convening committee of Jatiyatabadi Krishak Dal. Earlier on Saturday, Gano Forum’s two MPs-elect -- Sultan Mohammad Mansur (Moulvibazar-2) and Mokabbir Khan (Sylhet-2) sent a letter to Speaker Dr Shirin Sharmin Chaudhury requesting her to arrange their oath-taking ceremony on March 7. 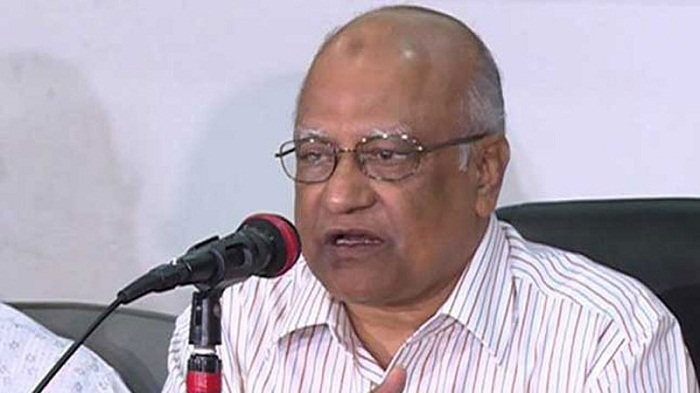 Asked whether their party has any scope of taking action against Sultan Mansur as he contested the election with BNP’s electoral symbol ‘Sheaf of Paddy’, Mosharraf said they will surely take necessary action as per rules and regulations against him if he finally takes oath. Replying to another question, he said the unity of BNP and Jatiya Oikya Front will not be affected if the two Gono Forum MPs-elect join parliament. BNP along with Gano Forum and some other parties joined the December-30 election in alliance under the banner of Jatiya Oikya Front. BNP bagged six seats while Gano Forum two in the election. The first session of the new parliament began on January 30 without the participation of the eight MPs-elect of Oikya Front.